Farm-City Week is a time to give thanks for the valuable partnerships between urban and rural residents. The week will be celebrated statewide, Nov. 16-23, 2016. Farmers produce high quality food and fiber for everyone to enjoy. Their partnerships with grocers, truck drivers, processors, scientists, consumers and many others all play important roles in getting the food from the fields to household tables. 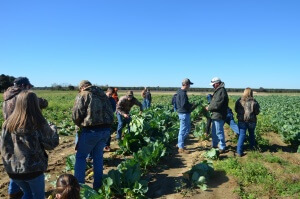 Local Farm Bureau members will sponsor multiple Farm-City Week events preceding the Thanksgiving holiday to celebrate the relationships that provide food abundance and strengthen the nation’s economy. Events include kid-friendly activities and educational demonstrations, vintage farm equipment displays, farm tours, food donations and essay and poster contests. Farm-City Week activities also highlight various food collection activities by farmers and ranchers on behalf of food banks and other charitable organizations in local communities throughout Florida. For details about the Farm-City Week event in your community, contact your local Farm Bureau office.